The commercial real estate brokerage business is competitive. VERY competitive. Competition is nothing new. It exists in many facets of life and has since the beginning of time. Sometimes it is life and death. Fortunately in commercial real estate brokerage it is not quite that dramatic, but sometimes you may feel like it is. Did you see the movie Gladiator? In this post I am going to share a great article written by David Breslow called 8 Ways to Compete Like a Gladiator. The message is excellent and in my opinion directly relates to what we as commercial real estate agents go through every day. Enjoy! Your toughest competition is and always will be…YOU! Whether you are in sports, business or any other arena of life, there is always the personal challenge of overcoming your own blocks and subtle forms of self-sabotage. In this way…we all “compete”. Becoming a great competitor is a learned skill. Learning to compete can carry you through the down or tough times and take you to the top when applied properly. You won’t always perform well or win but you can ALWAYS BE A GREAT COMPETITOR. Strength of character and conviction – – An honorable person dedicated and committed to your purpose, plan and path. Are you living or playing out your purpose or your plan? Great performers identify a strong purpose, set out a plan and become committed to the path building character along the way. Passion – – Giving fully of your emotion and motivation to the game you play. Top performers offer all of themselves to the performance not playing on their “heels” or playing “not to lose”. Give of all of your emotion and passions when doing what you enjoy no matter what “game” you choose to play. Champions stand in the shadow of their performances taking full responsibility for their actions. They know what they can do and what they cannot do at any moment and stay true to themselves along the way. Patience – – Regardless of the situation: being patient enough to work through it realizing you create your own response to situations. Someone once said, “The best way out…is through!” Top performers understand that each event has a natural ebb and flow to it. Patience allows them to remain clear minded, see opportunities when they arise and use them to their advantage. Vulnerability – – Unafraid to feel and express a range of emotion. Be real! Top performers aren’t afraid to make mistakes or fail. They are free to express themselves as part of giving fully to the game. They are not concerned about how they look to others. Their passion and desire triggers higher levels of performance. Use your emotions to perform better! Present Moment Focus – – Not resisting what’s happening in the moment can save you a tremendous amount of energy! This is the ability to accept current circumstances and remain focused on the “now”. You become a Solution maker! Champions know the only moment that exists is THIS one! They are better able to see what is happening and use their mental keys to create solutions instead of more problems. Trust / Faith – – Believing in yourself and the “bigger picture” enough to give fully here and now. Not getting negatively swayed by one moment or event! This is a BIG one! Champions are able to put themselves on the line more than others because they accept the possibility of defeat more than others. 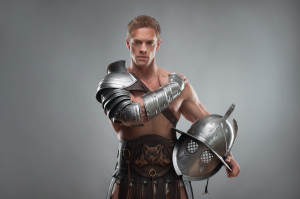 The Gladiator accepted death as part of battle neither inviting it nor running from it. They accept the paradox that says, “By accepting the possibility of defeat, you diminish the fear of it”. Notice how much you may be “holding on” and trying too hard. If you’re holding on…you’re holding back. It’s frustrating and a waste of your good energy. Play your “game” full out and realize the freedom that comes with accepting all possible outcomes ahead of time. It’s one of the many performance paradoxes. Understand the paradox and you can play FULL OUT! This entry was posted on Monday, October 13th, 2014 at 9:48 pm	and is filed under General Information. You can follow any responses to this entry through the RSS 2.0 feed. You can leave a response, or trackback from your own site.